ULTIMAX 6' Deck Stand, plus Shelf & laptop stand. This is a 6' Ultimax Deck Stand. Does need a couple of new knobs, two of the knobs have broken plastic bits. It's also got a custom made laptop shelf. It's got a custom made shelf, which I've covered with black carpet covering, you can fit 2 record decks and a mixer on it. Made by Ultimax in the UK, the 10 pieces fix together using either nuts and bolts or clevise pins to allow quick erection yet small and compact for transport and storage. Perfect to use with “combi” and “coffin” flight cases. Width 400mm. The wide version is particularly suited to "decks coffin" style cases. Quick to assemble. Basic Deck Stands. Simple, very heavy duty deck stands available in two widths. Available for most Ultimax DJ Stands. Deck Shelf 1.7m - DJ Stand Accessory. Heavy duty carpet covered deck shelves supplied with velcro dots for easy fitting and removal from DJ Stands. Smart carpet covered deck boards for rapid fixing and removal from deck stands. Easy to fit. During that process you will be issued with an RMA number. Images shown are for demonstration purposes. The ProStand. All ProStands and accessories are finished in ultra smart deep blue and are professionally screen printed for maximum impact. Footprint Width 850mm. 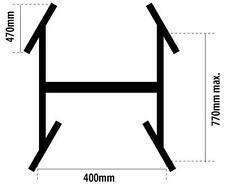 Top Width 410mm. Height 780mm. Technical Data. Ultimaxx Professional 2 in 1 Convertible Tripod/Monopod. – Easily & Simply Converts to a Monopod. – Fully Adjustable Center Pole. – 3-Way Ultra-Smooth Fluid Pan Head with Tilt Motion. – Includes Convenient Carry Case. The SURELOC system ensures the stand cannot slip once in position. It is in perfect condition. Working Load Limit 50kg. Leg Span max. Quick to erect, locks in position. There is no Top Hat with it. Ultimax certified rigging ropes for general rigging tasks. Covered Cable Ends. Music Box 26 #W634. A cost effective lighting tripod that features thumbscrew tightening on the main casting and a secondary safety collar. 10mm centre hole. Complete with Bolts and Wing Nuts. 4 x Wing Nuts/Bolts supplied. All 4 wheels are braked for locking in position. The addition of wheels to any Ultimax stand turns your stand into a dual shelved trolley instantly. Move your kit with ease. Fits all Ultimax DJ Stands. Speakers on a single tripod or pole. 555mm between centres of the spigots. Ultimax Premium DJ Stands. Ultimax Sumo DJ Stands. Available for most Ultimax DJ Stands. Deck Shelf 0.6m - DJ Stand Accessory. Heavy duty carpet covered deck shelves supplied with velcro dots for easy fitting and removal from DJ Stands. The carpet has been glued with a heated press to ensure durability. Exclusive Ultimax Castings with supplied with. Exclusive Ultimax Designs. An exclusive range of heavy duty Ultimax Castings. 32mm Heavy Duty Alloy Casting for Accessories - Open style. The Open Casting (UMCAST32OPEN) is designed for use on a 32mm pole and is ideally suited to holding 25mm (1”) square section. Centre bar only for Ultimax ProStand Standard (400mm). Speakers on a single tripod or pole. 295mm between centres of the 2 spigots. Exclusive Ultimax Castings with supplied with. Exclusive Ultimax Designs. An exclusive range of heavy duty Ultimax Castings. 50mm Heavy Duty Alloy Casting for Accessories - Open style. This open casting is designed for use on a 50mm pole and is ideally suited to holding 25mm (1”) square section. Centre bar only for Ultimax ProStand Wide (700mm). Speakers on a single tripod or pole. Dual Speaker Mounting Adaptor for mounting two smaller. 50mm Dia x 750mm Length Black G Clamp. Massive Range Available. Ultimax 2.4m Standard Tripods. Ultimax Premium DJ Stands. 50mm Dia x 1000mm Length Black G Clamp. Massive Range Available. 50mm Dia x 600mm Length Double ended Black G Clamp. Massive Range Available. Heavy Duty Mounting Plate for all makes of 50mm triangular truss. Fits most adaptors. 50mm Dia x 500mm Length Black G Clamp. Massive Range Available.